Last year when I went to Naples I was is the midst of a magnitude 10 heartbreak on the Inolongerloveyou scale so when the opportunity arose to visit a place where everybody’s lives were blown to smithereens by an angry Volcano, it immediately appealed. Of course Pompeii appealed for other reasons. Everybody can conjure up in their mind the bodies preserved in ashes that have given the town its uniqueness since archaeologists identified it at the end of the 18th century. Like many thousands of people before me, I have to admit that what I really wanted to see in Pompeii was these mummified bodies struck by a scorching blaze that paradoxically froze them in their last position. It is not until I arrived at the Herculaneum gates that I realised Pompeii was going to be much more than the sum of its body parts… Obsessed as I was with fulfilling my morbid curiosity, I had not really spared a thought to the actual town of Pompeii so, as I stood in the forum, surrounded by loud American tourists (or is that a truism? ), the scale of the town that spread in front of me took me totally by surprise. Pompeii is not, as I had assumed, a pile or semi-well preserved rubble you can tour in 20 minutes. Its wall is 3200 long and the town is divided in regions, themselves divided into blocks. Streets are still clearly visible as arteries, large streets and alleys. On top of this the town counts a large theatre, a small theatre, an amphitheatre, gladiator’s barracks, public baths, temples, market places and a brothel. No doubt people knew how to live before TOWIE was invented. Map in hand, getting lost more than once in the very symmetrical looking streets and edifices, it took 6 hours to visit most places the guide listed as “of interest” but not all of them. The other thing that took my breath away is how well preserved the site is (Unesco is doing a very good job of restoring it). It is possible to imagine people passing you in the streets to get into buildings that are invariably missing their roofs but not much else. It is possible to follow the day of a well off citizen leaving his richly decorated house in the morning, talking to his friends in the forum, going to a self-service restaurant for lunch, followed by a bath where it is still possible to see the ancient version of lockers, an evening at the theatre, getting drunk in a bar and finishing by an hour at the brothel where we can still see the “menu” he had to choose from as it is painted on the walls. After much meandering under the hot sun and cobbled streets, it dawned on me that I had not seen many corpses at all. Only the dog’s one near the entrance and a few more in one of the houses. In a way this was good as taking away the morbid voyeuristic thirst of the average tourist makes it easier for them to concentrate on how much life there is still left in the town. It is only on my way to the Sarno gate that I realised the exhibition of the bodies takes place in a sheltered building, away from the sun. Few people were talking inside as the reality of death was staring at us tired pilgrims. There they lay, frozen in a macabre dance, exposed to the scrutiny of the living: children, pregnant women, loved up couples, single men, all taken by the majestic volcano dominating their town, offering one hell of a view or just one hell depending at what time they lived there. 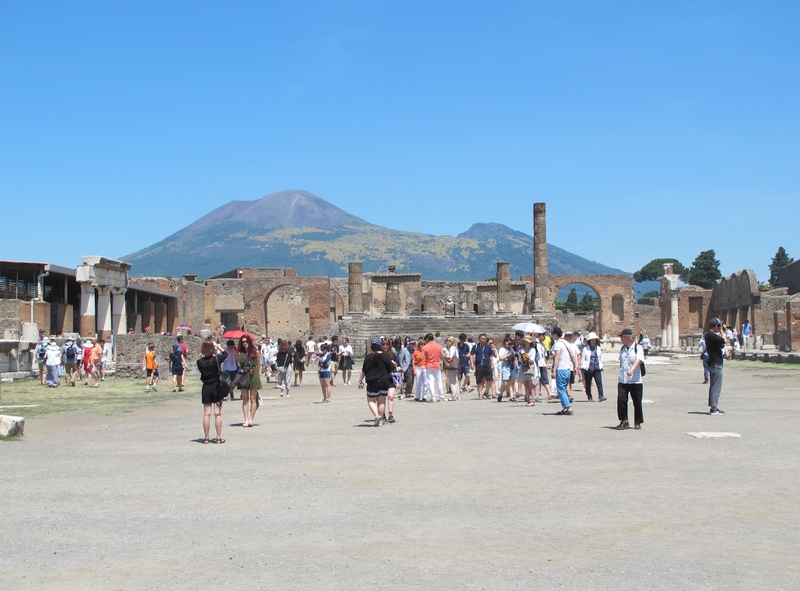 As I left, I felt happy that Pompeii was anything but a ghost town. In fact, despite the Vesuvius, despite the burning blast, despite the ashes, despite the pillages, and despite the tourists, its heart has never stopped beating and that was a moral I was happy to take with me in the hour long commuter train bringing me back to Naples along with now very quiet American tourists. The dishes were kept warm by a fire in the holes. Fast food the ancient way. It’s good to see so many blogs and so many universes. Having had several Norwegian students in my class this year I would very much like to see Norway for real but I’ll just start digitally. Thanks for sharing. You’re very welcome! There’s more than 5000 ‘full screen’ photos waiting for you! It’s definitely a place that leaves an impression!